If you need to find out how to measure your existing opening so you can work out the exact size gate, fence or railings you need then take a look at the below information. Regardless of whether you are fitting a single metal gate, double gates, metal fence panels or garden railings the process detailed below will be the same. Simply find the one that applies to you and follow the instructions shown. Fitting between existing structures - For gate installations that are to be fitted between existing walls or pillars all you need to do is measure the exact gap size and this will give you the ordering width. It really could not be any easier than that. Fitting between existing metal posts – Repeat the process above only this time measure from the inside of one post to the inside of the other. Please note that you will probably need to remove existing hinge pins as that new gate you order wont necessarily have the hinges in the same position. No existing structure in place – This kind of installation will require the addition of metal posts to provide support therefore the space they will take up needs to be accounted for. To do this measure the total space you have available then deduct the width of the posts from this to give you your ordering width / gap size. If you need help with this method of installation please contact us for assistance. Double - To achieve a 10ft opening using 2 x 3" posts, you will require a total space of 10ft 6" (width of 2 x posts and the gate). 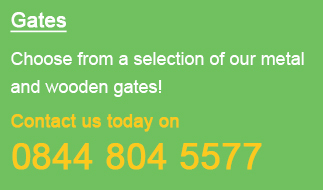 Before you read any further it is important to point out that all the wooden gate designs shown on the website are listed as the physical width and height of the product and NOT the structural opening width. We have made no allowance for the hinges and latch. Fitting between existing timber posts – Simply measure the internal distance between the posts then deduct ½” from this measurement (for single gate installations) or 1 ½” for double gate installations) to find your ordering size. No timber posts in place – In this instance you will need to establish the total space you have available then deduct the width of the posts you are using. Once this has been established repeat the process detailed above. Double – A pair of 8ft wooden driveway gates fitted to 2 x 6" timber posts, will require a total space of 9ft 1 1/2" to be installed correctly (the width of 2 x posts, the width of the gates and an extra 1 1/2" for the hinges and latch). 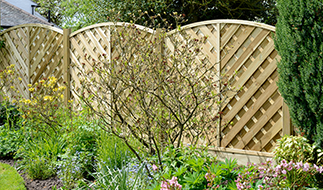 Single - 3ft wide wooden garden gates installed using 2 x 4" timber posts, will require a total space of 3ft 8 1/2" to be installed correctly (the width of 2 x posts, the width of the gate and an extra 1/2" for the hinges and latch). Please be aware that we list the height of the gates in 2 ways. Physical Height: Where the height is referred to in this manner we have made no allowance for ground clearance. This means that once installed the fitted height will be approx 2” larger than that stated. Height (once installed): Products shown in this way already include an allowance for ground clearance. This means the physical height will be approx 50mm smaller than that stated. When measuring for your new gate, fencing or railings it is essential that the opening is measured in at least 3 places. We usually suggest top, middle and bottom. The smallest measurement should then be used for ordering purposes. (If the measurement is not the same width for the full height of the opening packers may be required). Certain products are heavy and will require a suitably strong surface to be fixed to. As such, prior to installation, make sure that the existing posts or pillars are of adequate strength. Should new posts be required, we can supply these in a range of sizes, heights and designs to complement the chosen style. Where posts are required, ensure the additional space they need is taken into account when ordering. If you are still unsure about the size that you need please do not hesitate to contact us by phone or email and will will offer any help or advice you need.